A true double-beam spectrometer. The SavantAA can be configured to exactly meet your analytical and budgetary requirements. The basic instrument includes advanced features such as programmable gasbox, 8 lamp turret with auto alignment of lamps, optimization of wavelength and slit width and setting of the lamp current. The instrument building blocks include the optional Super Lamp Power supply for 1 or 4 lamps, the optional coded lamp recognition, the optional automatic burner rotation and optional Electronic Sample Viewing which allows real time colour viewing of sample compartment, a must for graphite furnace analysis. 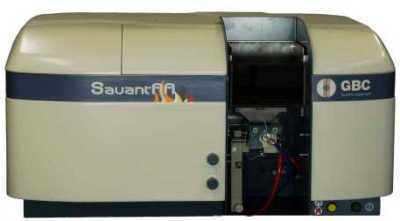 The SavantAA is also available as the SavantAA No Flame which is without a gasbox allowing a dedicated graphite furnace or hydride AAS. The SavantAA is controlled by the SavantAA Windows® Vista based software offering the ultimate combination of power and simplicity. Eight lamp fully automated turret with auto alignment of lamps for sequential multi-element analysis. Programmable flame control with ten safety interlocks provides reproducible operation with gas flows automatically set when changing methods. All-reflective optics for high light throughput. Automatic wavelength setting, 185 to 900 nm. Continuously adjustable slit width 0.1 to 2.0 nm in 0.1 nm increments in both normal and reduced height with automatic setting. Asymmetric modulation reduces noise by up to 40%. Hyper Pulse fast background correction provides 175-423 nm correction range, at up to 2.5 Abs. Optional 1 or 4 Super Lamp Power Supply.